Situated just over 200 miles to the west of mainland Italy, Sardinia is the second largest island in the Mediterranean Sea. 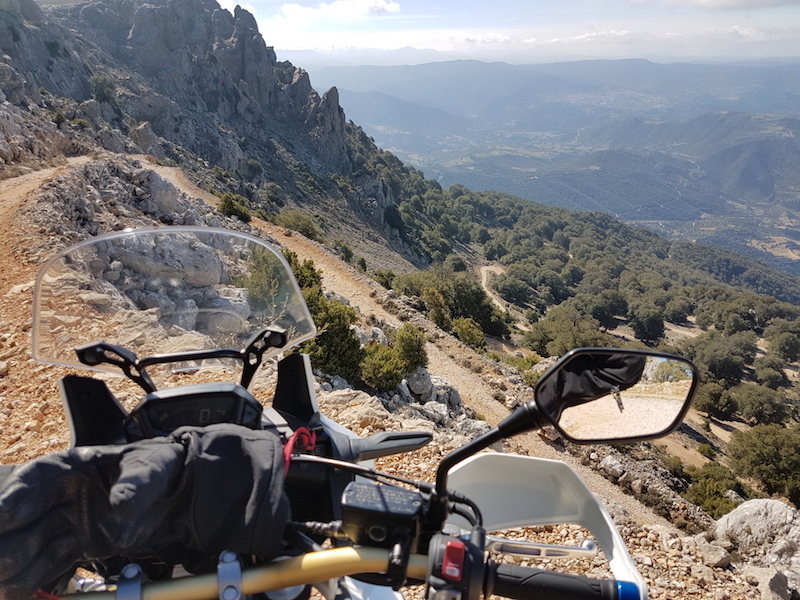 With over 1,149 miles of spectacular coast line that encircles an interior of rugged, mountainous terrain, it’s a playground for any adventure-seeking motorcyclist. 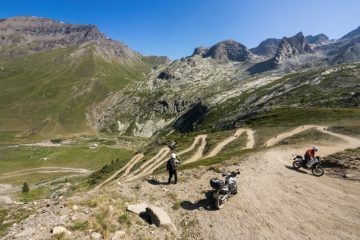 Here, you’ll find thrilling tarmacked roads to satisfy the road warrior in you, along with miles and miles of off-road pistes just begging to be explored on two wheels. Getting to the island is a simple affair, as well. The crossing from Civitavecchia on the mainland of Italy to Olbia in the north of Sardinia is convenient for a number of reasons. First off, it’s an eight-hour overnight sailing and there are comfortable bunks, so you don’t lose any riding time and arrive early morning good and fresh. Secondly, there are daily overnight sailings from Cagliari in the south of the island to Naples on the mainland which means you can tour from north to south (or vice versa) without backtracking. 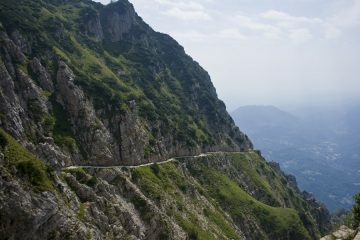 And, once you’re in Naples, it’s just a short ride to the chaotic but magical Amalfi Coast road. 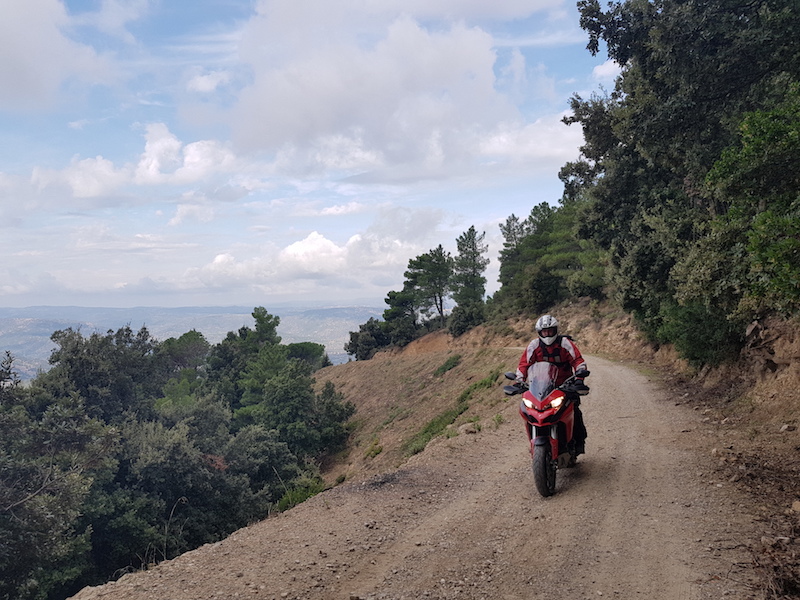 Prior to our 2018 trip I’d spent time on Sardinia riding, hiking and climbing throughout the country. From the magnificent SP71 costal road down at the very south of the Island right up to the tip of the Punta Marmorata peninsular up north. However, as is usually the case, it’s the regions with high rugged peaks that tend to draw me back and that was the case on this occasion. 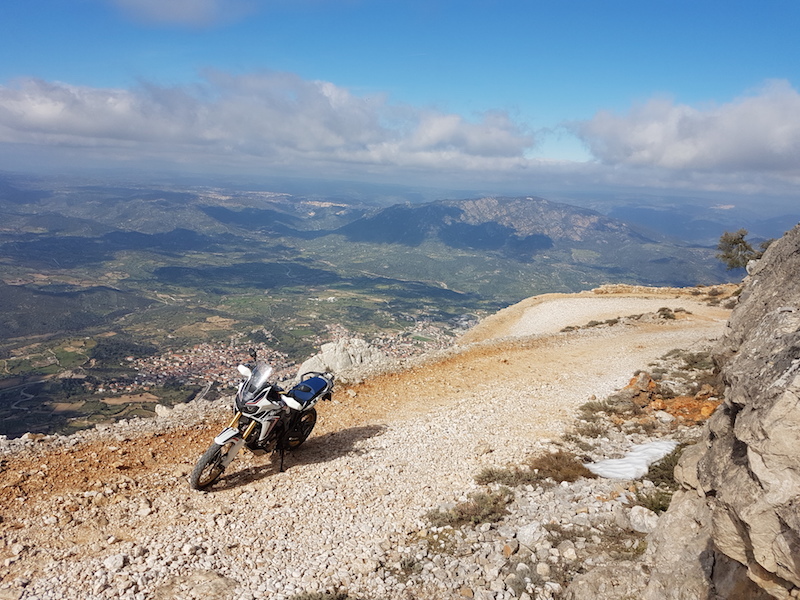 If you’re going to tour Sardinia and your idea of an adventure ride includes off-road trails, then you just have to head to the mountain village of Oliena near the island’s highest peak. Once there you’re going to need to find the hotel and restaurant Albergo Monte Maccione. 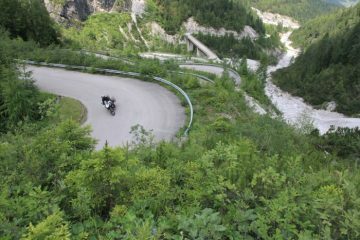 The hotel is on the mountainside way above the village and the ride up is all tarmac but be prepared for an outrageous sequence of hairpin bends, I counted 18 within a single mile. It’s worth popping in here for a coffee even if you have no intention of riding what comes next. 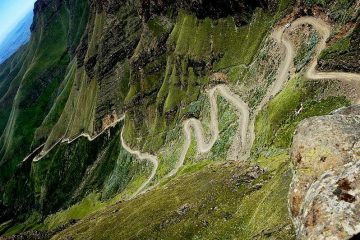 From the hotel, follow the road until it turns into a trail and take the next right. 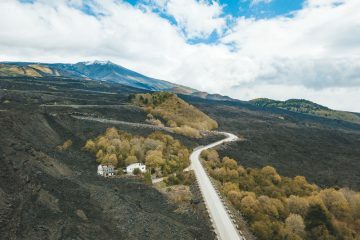 From this point on you’ll need to have off-road experience and a good head for heights as the trail ascends the high rock face ahead, the Punta Corrasi. 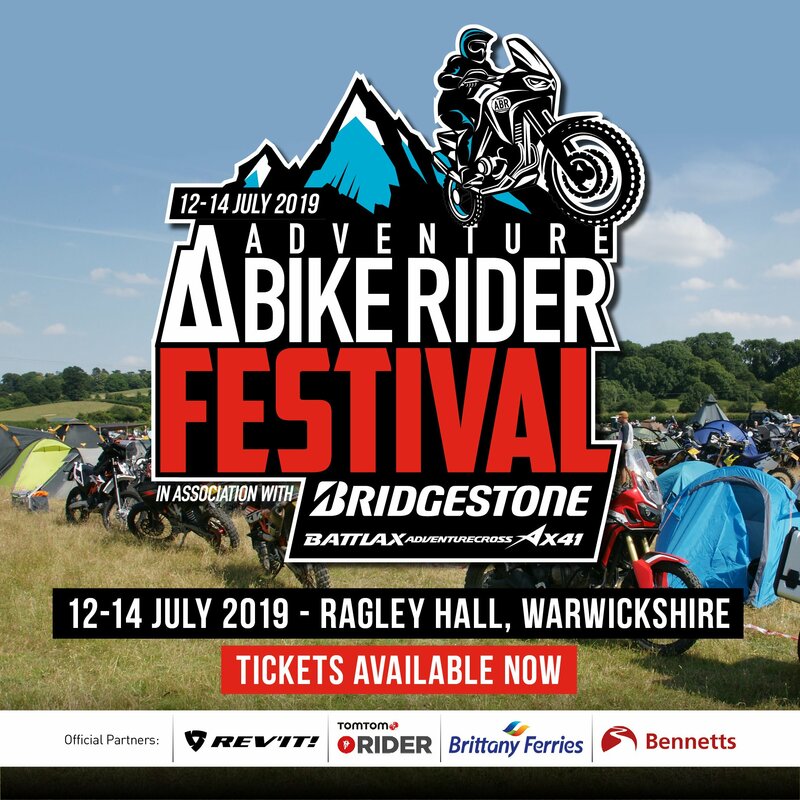 This trail is a fantastic adventure experience and whilst I’d not class it as highly technical (if you’re competent riding rocky trails, you’ll be OK) it does require a cool head and safe hands especially if you are riding a big, heavy adventure bike. On this occasion we did not reach the top due to a landslide about 200 metres from the summit but having been up the trail two years previous I can’t recommend it highly enough. Go and ride it you’ll be delighted, or terrified, or both. The views from the summit, and as you ascend rapidly up the rock face as outstanding, and it offers a true feeling of adventure. There’s plenty more to discover in Sardinia with the spectacular costal region of Cala Gonone nearby, and the dramatic coastal cliffs of Cala Goloritze – last time I was there you could ride down on dirt tracks to viewpoints. And if you’re intending to depart via Cagliari, set aside some time for the SO71 and take a ride over to Sant’Antioco Island via the causeway on SS126. 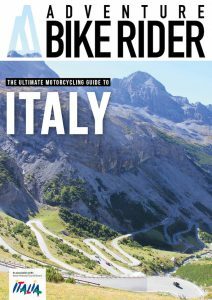 If you’re planning on touring in Italy, then you’ll want to check out our free 24-page guide to touring in the country. 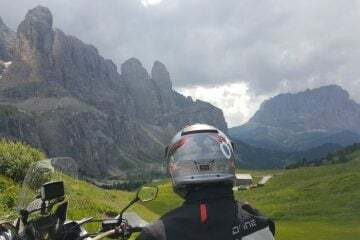 Along with the spectacular riding to be found on Sardinia, we’ll give you suggestions on roads not to miss on your next European tour, including the magnificent off-road Colle del Sommelier, the iconic Stelvio Pass, and one of the most visually stunning rides you can ever hope to witness from the saddle of a motorcycle, the Sella Ronda in the Dolomites. To get access to the full 24-page guide, simply fill in the details below. This form collects your contact information. I would like to receive competitions, exclusive offers and other promotional emails from Adventure Bike Rider. I understand I can unsubscribe at any time. Publisher Alun Davies launched Adventure Travel magazine over 23 years ago so that he could climb mountains and call it work. Following a motorcycle accident in 2010 Alun found himself with some enforced free time during which he launched ABR magazine - another of his passions.